Day 1 - Depart ATLANTA, GA in a spacious, video and restroom equipped Motorcoach as you head for your destination: The Ark Encounter & Creation Museum! This evening, you will have dinner and check into your Cincinnati area hotel for four night stay. Day 2: Start the day with Continental Breakfast before the big event you've been waiting for: THE ARK ENCOUNTER! Bigger than imagination, this life-sized Noah's Ark Experience will amaze you. Ark Encounter features a full-size Noah's Ark, built according to the dimensions given in the Bible. Spanning 510 feet long, 85 feet wide, and 51 feet high, this modern engineering marvel amazes visitors young and old. From the moment you turn the corner and the towering Ark comes into view, to the friendly animals in the zoo, or the jaw-dropping exhibits inside the Ark, you'll experience the pages of the Bible like never before. This evening, enjoy dinner before heading back to your hotel. Day 3: Start the day with a Continental Breakfast before you head to The Ark Encounter's sister attraction: THE CREATION MUSEUM. Prepare to believe as you explore 75,000 square feet of state-of-the-art Creation Museum allows you to venture through biblical history. Tonight, enjoy a local Dinner before returning to your hotel. Day 4: After a continental breakfast, you'll start your day by feeding a live giraffe at one of the TOP RATED ZOOs in America. CINCINNATI ZOO AND BOTANICAL GARDENS. If you wish, feed lettuce to a giraffe under the supervision of a zoo staff member! You'll also witness Mammals, Amphibians, Fish, Birds, Invertebrates, Reptiles, a stunning Garden and more! Afterwards, you'll head to the famous NEWPORT AQUARIUM: 70 exhibits, 14 galleries, five seamless tunnels totaling over 200 feet in length. Sharks (including a Shark Bridge), Penguins, Gators and Canyons Falls are just part of what you will experience here. This evening, enjoy Dinner before heading back to your hotel. Day 5: Today, after enjoying a Continental Breakfast, you will depart for home... a perfect time to chat with your friend about all the fun things you've done, the great sights you've seen, and where your next group trip will take you! 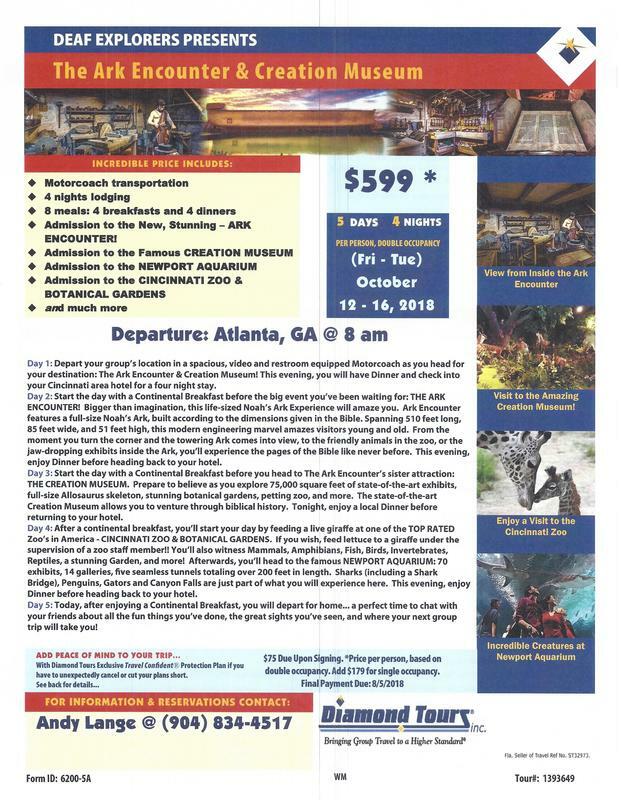 Price for this trip is $599.00 PER PERSON. We need a minimum of 30 people to go. If we fall below the 30, the price will change to reflect smaller number of people. Departure will be Friday, October 12, 2018. Return date is Tuesday, October 16, 2018. The departure location and time will be: ATLANTA (Exact location to be announced later). Leaving at 8 am sharp. Which Monthly Payment Plan Do you want to use? 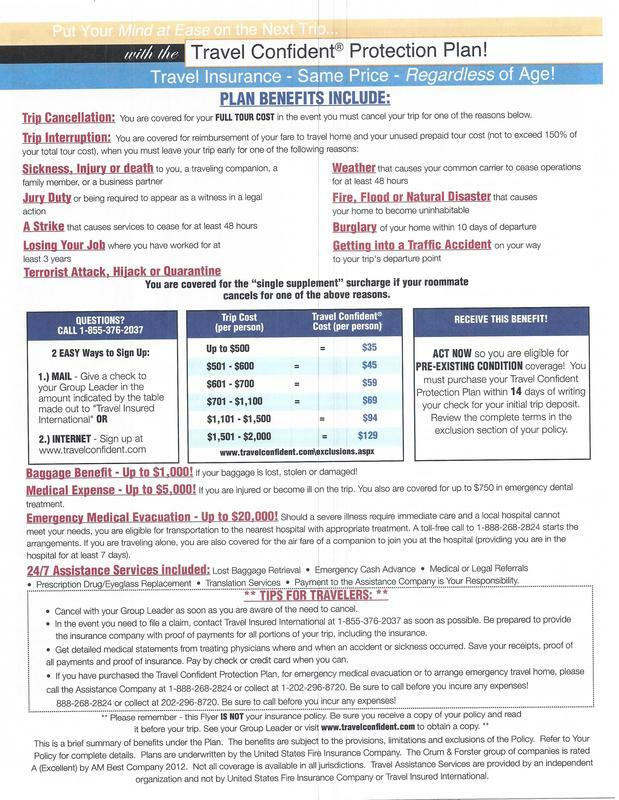 Plan "D" - Deposit + Travel Insurance $134.00 Then $100 Mo. Plan "E" - Deposit + TI ($134.00) then $200 mo. Plan "F" - Deposit + TI ($134.00) then $300 mo. Travel protection is highly recommended and starts at about $45.00 a person. If you have pre-existing medical conditions, you need to purchase travel protection within 14 days of making your deposit. Have a question? Let us know. Send us a message.